The other day my niece Maggie asked me if my grandkids were fussy eaters. She had heard me talk in the past about how Kaiya in particular has very specific tastes in food. Pizza and buttered noodles with parmesan cheese are about it. Well, and most things sweet. The rest of my grandkids have much broader palates. But they ALL like most things sweet! 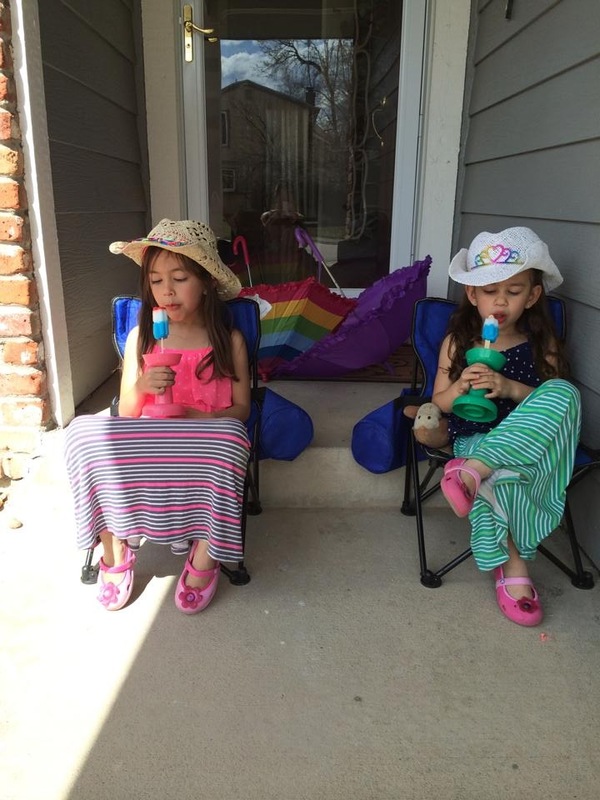 Kaiya and Mylee enjoy a popsicle on their front porch. I have always been told – and therefore believed – that if you cook with your kids or grandkids, they will develop a love of lots of different foods. I can assure you that this is not necessarily true. Kaiya loves to cook with me, but unless it’s something sweet, she will turn up her nose at the idea of eating the final result. Once she helped me make lasagna. Under my watchful eye, she carefully layered the tomato sauce, the meat, the noodles and the cheese. When we sat down to dinner, she wouldn’t even consider tasting it. “Buttered noodles with cheese, please,” she will ask for every time. It’s interesting watching kids develop their tastes in food. 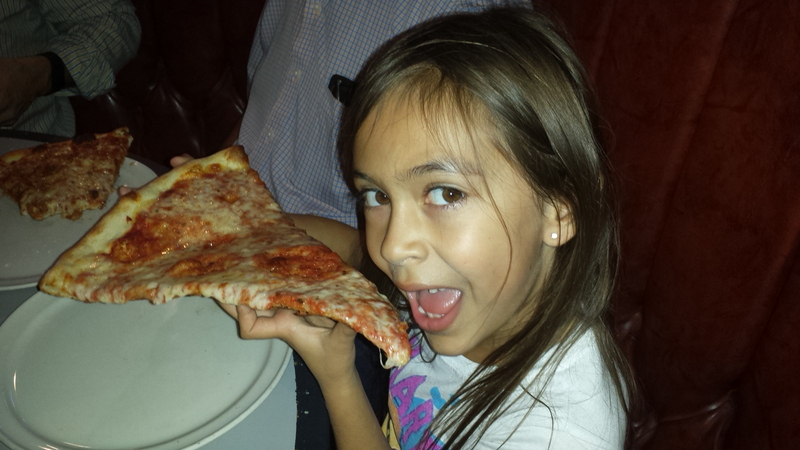 For example, while certainly not a fussy eater, 7-year-old Maggie Faith has a decided distaste for pizza. It’s about the only thing she will turn her nose up 100 percent of the time. Not Kaiya…. Dagny loves most kinds of meat, but will turn up her nose at fish or seafood of any sort. On the other hand, her brother Alastair, while certainly a meat eater, will choose fish or seafood every time if given the opportunity. 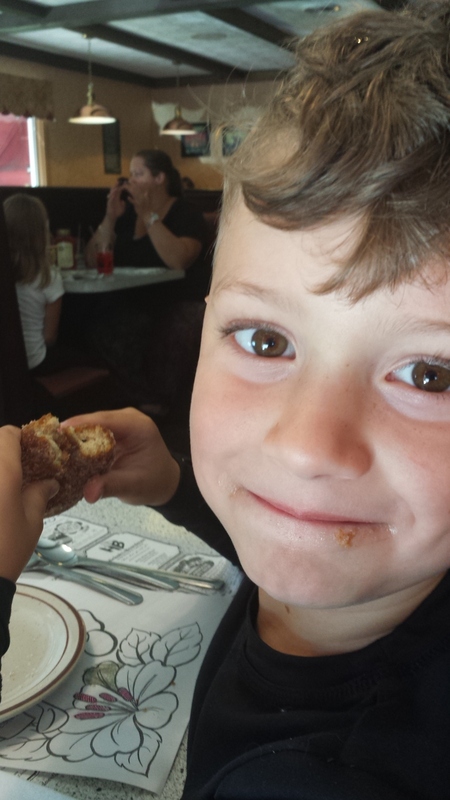 Joseph enjoyed a cinnamon donut during our visit to Vermont. I think most of my grandkids eat some sort of sandwich for lunch. Even Kaiya will eat (or at least take a bite or two of) a Nutella sandwich. Mylee is the exception. Her lunch? Raw fish (sashimi) kept fresh in an ice pack in her lunch box. I’ll bet no one wants to trade for her lunch. I would, however. I honestly don’t remember not liking anything my mom cooked. There were certainly no short orders taken or given. We ate what she cooked, as I think did most of my friends. It was a different time. 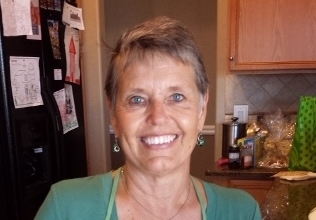 There were things I liked less well – I could have lived a long time without a bite of pork roast – but most things were delicious. A few weeks ago, Court and the kids came to our house to watch a Bronco game and then stay for dinner afterwards. As we watched the game, I shredded a mound of Swiss cheese to use in the macaroni and cheese that my grandmother used to make us. As I shredded the cheese, both Kaiya and Mylee kept coming up to me and stealing handfuls of the cheese. I didn’t blame them. We used to do the same thing when my mother would make Swiss Macs. In fact, she took to hiding the plate full of cheese in the cupboard so we couldn’t eat it all. 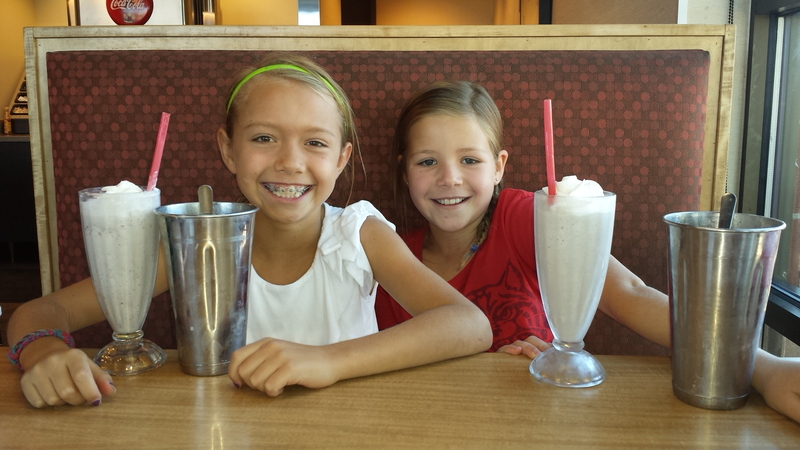 Dagny and her friend Brynn loved them a milkshake as we celebrated D’s birthday. Later that night, I offered them some of the prepared Swiss macs, and they both were aghast. Heavens no! Yuck. It didn’t matter because they were not going to even give it a try. What did they have for dinner? Buttered noodles with parmesan cheese. Sigh. I have one friend who always made her child something “short order” at dinner time. I wondered if he would ever out grow that. But he is 17 now and happily eats anything and everything she cooks! I think it all fixes itself in the end. I presume Kaiya will not be limiting herself to noodles or pizza her entire life!